How do we spend your money? As a fosterer many visits have to be made to our vet and vets cost money. All cats and kittens that come into our care are vaccinated, micro chipped, treated for fleas and worms, and neutered. In addition there are the everyday costs of feeding and providing litter material. The love and care come free of charge and I am happy to cover the cost of travel and electricity for my two pens. 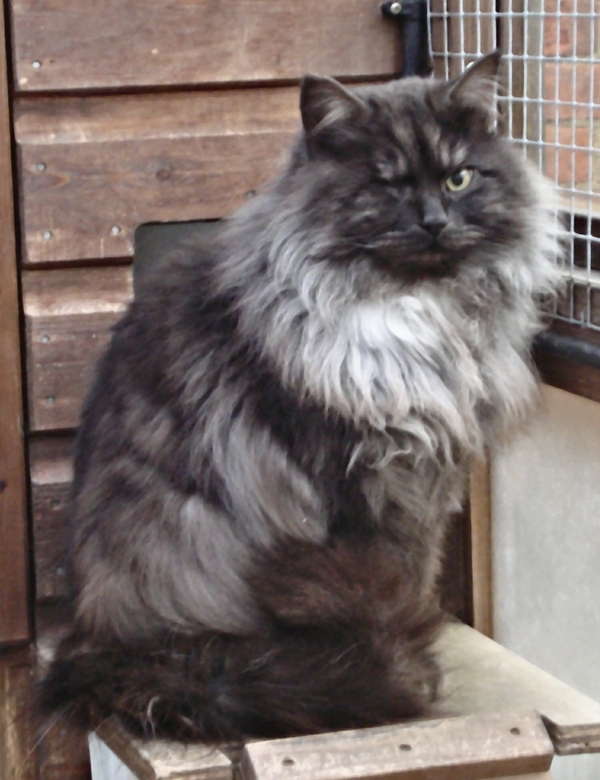 Occasionally, however, a cat comes into our care that needs a great deal more and two recent cases illustrate just what is done with the funds so generously provided by our supporters. Without the funds, these two boys would not have survived long. family dog blinded him in one eye. Apart from emergency treatment he received little care and came to the branch because he was spraying indoors. At his first visit to our vet he was vaccinated and micro chipped and started on a course of anti-inflammatory drugs to ease his suspected urinary discomfort. I helped clip off clumps of matted hair from around his face and neck. Watching him in his pen it was obvious all was not well. Being in a stress free environment he was not spraying but using his tray frequently to produce small amounts of urine each time. Urine samples were required. This is not so easy with a cat as Milo could not be expected to use a bottle! The first sample showed crystals formed in his urinary tract which must have been extremely painful. Additional drugs were provided and Milo put on a special diet food. Every two weeks further urine samples had to be collected and although the crystals started to dissipate the blood in his urine was not a good sign and we feared the worse. After six weeks the news came that all was well. Milo needs to stay on his special diet for the foreseeable future and have one last urine test in a few weeks time to make sure all is well. Free from pain his natural friendly, playful nature has emerged and despite only one eye he jumps and plays like any other young cat. Sandy was left at Eagle vets after a reported road accident. Collecting him to come into care I was told he showed no signs of injury but that he was a bit snuffly. 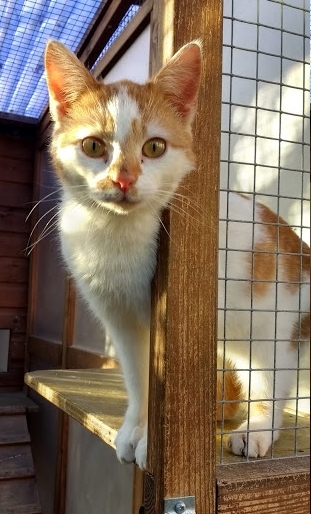 Just 6-7 months old Sandy is a ginger and white lad who craves attention and climbs around one's shoulders given the chance. After his first routine visit to our vet it became clear Sandy was having real problems breathing. He wheezed and sneezed and sounded at times like a small steam engine. Anti-inflammatory drugs and anti-biotics were prescribed to treat a respiratory tract infection and suspected laryngitis. It was painful to watch and hear Sandy coughing, sneezing and wheezing whilst the drug treatment took effect. He was affectionate but would not (or seemed not to know how to) play. At length I took Sandy back for further examination and he was sedated to examine his throat, take swabs for laboratory examination and check for any physical obstruction. Whilst sedated it was suggested that a chest X-ray was needed. Fosterers do not usually authorise expensive tests without permission but in this instance I gave the go-ahead and thank goodness I did. I saw the X-rays and poor Sandy had extensive black shadows indicating pneumonia. Large amounts of fluid were removed from Sandy's lungs and a course of steroids and further antibiotics prescribed pending the results of the lab tests. A few days later and the lab tests are now in and show that Sandy has pseudomonas. Pseudomonas are a known pathogen that can cause bacterial diseases in cats, particularly respiratory infections. Sandy is now on another medication and will need a further visit to the vet in a week's time, but we are now hopefully that he is on the way to full recovery. The good news is that the medication seems to be having a benefificial effect and Sandy is a much happier young cat. He has begun to play and dash around the pen looking much more lively and less wheezy. So, once again, thanks to the generosity of those who donate to our branch, two young cats has been given the chance of a good future and hopefully will, in a short while, be able to go to their very own homes. If you would like to donate to the branch, click here to download a form.